Michael Jackson died at age 50 on June 25, 2009. Michael Jackson will forever be remembered as the KING OF POP and his songs will be played for hundreds of years. He was one of the greatest artists of our generation, despite many controversial incidents in his life. His death has been a shocking incident worldwide. On the day of his death many websites such as TMZ and Twitter had trouble staying up. 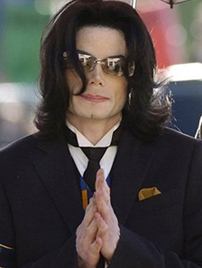 For the latest news on Michael Jackson's Death and Memorial, visit here. We have also set up a Facebook MJ memorial page and have been posting the latest MJ news. Please visit and leave comments. Our site has been the Unofficial Michael Jackson Forum since 2004. Apart from our great and lively discussion forums, you will also find the latest MJ news, image galleries, discography, MJJ's biography, our online shop and much more! We aim not only to have the best Michael Jackson forums on the net, but also the greatest MJ community. So please join us now! The producers of a new Michael Jackson musical have said production will continue regardless of 'Leaving Neverland' documentary controversy. Nigerians are flatly refusing to entertain any comparison between Michael Jackson and Beyonce with majority of Twitter users calling the move a misnomer. Please visit our Facebook page for addiational news.